An aerial view of Mt. In November's Windham Art Gallery group show entitled "Inside/Outside," two artists stood out as having extremely unique approaches to the venue of "landscape painting." Both styles of work have been arrived at over time and seem based on accurate and personal observation by each artist in interaction with the natural landscape. Both also have a conceptual element of thought added to the process, enhancing their expressions of experiencing the planet. Susan Wadsworth, who conceived the theme of the show, has familiarized local eyes with her approach to landscape in many previous shows at WAG. And "approaching the earth" is exactly what one feels one is doing when taking in Wadsworth's view. Her landscape visions transport the viewer high in the air--as if they were a bird soaring above, surveying the earth below--to a point of view overlooking an expanse of waterways and landmasses. The effect reveals the large shapes delineated by nature's rhythms: gravity, climate, time and erosion. Looking down on the rounded shapes representing elemental masses, the viewer sees the earth in its verdant jades and reflective blues. The artist tends to soften these colors and to personalize them, the way she does also with the round-edged descriptive shapes she uses to describe her subject. While works previously shown at the co-operative gallery have made her soaring perspective familiar, the "Bryce Canyon" pieces in this show have returned to a feet-on-the-ground human view, while preserving the same feeling of endless expanse. In fact, the artist traveled to one of the most expansive landscapes in the country in order to create these pieces. Susan explained that, previously, many of her subjects were found while accompanying her pilot husband, David, up into the clouds. By making videos of the earth below, as seen from the plane, she could then "freeze-frame" images on the screen, and work from them in her method of pastel layering, which has developed in her work. Lately, however, since the couple has added three children to their creative endeavors, aerial flights have decreased. For the making of the "Bryce Canyon" series, the family accompanied the artist to the Southwest, to be captured in her views of vastness populated by giant timeworn and towering rocks. She explained that some images were arrived at by making composites from more than one photo, so that in some pieces, her children appear more than once. Wadsworth has been working through a stylistic development, which has stayed in focus since the inception of the first rounding of corners in her work two decades ago. She mentioned being inspired by the round-edged rectangular shapes in Marc Rothko's work and by the work of Arthur Dove. In spite of these influences, however, her "overlook" seems quite original as an approach to landscape subject matter. She develops a language of shapes in each piece, exploring the range of size and character of such shapes while keeping them all-of-a-family. Rounded, windswept rocks are echoed in the shapes of figures in shawls, a stuffed green backpack, or the baseball cap on her young son's head. 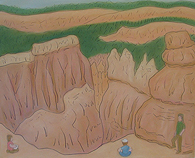 The figures of the children sit quietly observing the vista, and, in one case ("Bryce Canyon II"), a little girl and boy seem to be making drawings. Wadsworth uses graphite loosely to texture surfaces of rocks. A series of Morse code-like dashes and lines skip along and seem to spiral inward in "Bryce Canyon II: Hoodoo View." 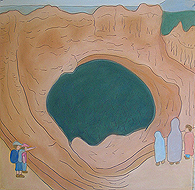 The shapes in this piece, and the other "Bryce Canyon" works are colored in rich pastel greens, sandy and adobe tans and oranges, and powdery blues (of the distant hills and mountains). The effect of these shapes, in these colors, when seen from the distance, might be compared with television views of golf courses as seen from a TV helicopter, as the camera pans in at the opening of a PGA tournament. Like sunlit greens, sand traps and waterways, the rounded shapes interweave. Susan Wadsworth's style of work is original and maturely developed. She speaks about the vastness of the planet and the richness of its colored wardrobe. Everything in the pastels seems of one nature: the shapes, marks, colors, and pastel technique all convey warmth and lushness, even as the viewer realizes an almost childlike wonder being conveyed through the awesome scale of her subject. One viewer at the gallery remarked that it reminded her of reading "The Little Prince" when she was a child. But, really, in this work, it is the knowledge of elemental integration and the focused clarity needed to find an original, intensely personal style, which makes the work so successful. As Susan noted in one of her titles: "You have to get out of the car to see this!" Exhibited on the same north wall, and to the left of Susan Wadsworth's pastels, were a group of oil paintings on canvas by the artist Camilla Roberts. Roberts' manner of celebrating being in the landscape is equally as original and also relies on an introduced (and quite poetic) conceptual idea. The theme of the "Inside/Outside" exhibition seemed to be captured most specifically in her work. That is because she shows the landscape inside the figure as the figure itself is depicted outside, in nature. And though this sounds complicated, it is actually quite simple. Roberts explained, in a statement provided for the show: "I articulate the experience within the body as a reflection and response to the reality outside the body, to express immersion into the surroundings. I use the silhouette. 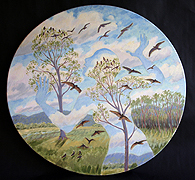 The landscape in which the figure is moving is depicted within the silhouette as well, but in a shift of scale or focus. The body is there and not there, distinct, yet participant." Picture a landscape in your mind, one you know well, and a good place to walk. In the middle of this view, moves a figure, but all you see is its shape. Inside that shape is a section of the surrounding view, filling the human shape. It is not transparent, allowing you to look through it, but is rather filled by the subject matter it is experiencing. This idea transcends concept-for-concept's-sake and is hugely metaphorical and poetically expressive. She seems to capture the love of a place by the people who live there for that love. Remember, the last time you took a walk in the forest, what were you filled with? The forest, of course. Why do we go out, away from civilization, walking, or as in some of her paintings, cross-county skiing, if not to empty ourselves, to be refilled by nature? In a painting entitled "November Hilltop," we see the forms of a man and woman arriving together at a clear vista on the hillside. The 'arrival' can be felt in the body language of the figures, as they pause in their movements, simultaneously turning to the left to see the view together. The figures' movement is precise enough to tell the viewer that they are a couple. And one wants to look not at them, but with them. 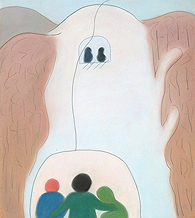 Seeing the figures, with their surroundings inside them, at first seems to make reference to some surrealist pieces, particularly the work of Rene Magritte. But this work is more poetic than it is surrealist. The concept, in this case, serves as a conduit for expression. It is not the subject itself. In fact, the landscape elements comprising the figures' interiors symbolize the very thought of that figure. This is illustrated in the painting "Aspen Grove." 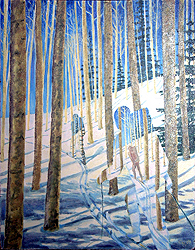 In this painting, two figures move along a hillside ski track, on cross-country skis. In the more distant, leading figure, we see the landscape ahead, as if that were the leading figure's thoughts. In the closer, following figure, an image of the figure ahead can be seen, as if the second figure was focused on the first. There's something marvelous about these landscape-filled figures. While the artist might have generalized, on the gestured movement of the hikers and skiers, and still got the idea across, Roberts would not be so easily satisfied. Her figures reveal much through their specifically described body language. 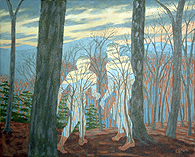 In the painting "Hemlock and Beech Trail," a lone climbing figure, just emerging from the hemlocks and entering the winter-bare beech trunks ahead, leans forward with precisely the tilt of someone pushing the uphill pace just a bit, intent on their destination. She also is clear in her focus and keeps the landscape to a narrative level of expression. While the expressive rendition of a landscape can be subject matter in itself, in this case it would only interrupt the vision being expressed. But her narrative description is also extremely accurate in capturing the essence of Vermont's varying physical characteristics and constantly changing light. In "Above The Treeline," a single cross-country skier is transversing a high mountain pasture deep in snow, which is highlighted with warm reflections. There is a crystal clarity to the atmosphere that seems authentically like the real experience. Mountains and sky fill this figure, the same mountains and sky that we see in the distance. The figure hunches over a bit, leaning into this high point in the trail, but, while we feel the strenuous aspect of the physical experience, we can see the transcendence and joy in the mind of the skier, by the clear view of the mountains that fill his shape. These paintings will be appreciated by nature lovers, cross-country skiers and naturalists, and by all those who love those moments alone in nature which one only earns by going there. Of course, there is nothing like the real thing, but this comes powerfully close to it. If in fact you cannot go a-wandering all the time, having one of these works would be a joyful reminder of the experience, and maybe a reminder of what awaits us when we take the time to escape into the beautiful mountains we live in. Camilla Roberts' work is excellently rendered, filled with accurate description and wonderfully poetic. It is a vision of Vermont, by a Vermonter for Vermonters, or, perhaps, for a flatlander to take on home.